Is it the same as the full hardbound edition? It is the same as the hardbound, except that it is more compact and includes some additional indexes in the back. It is a very nice little volume, which I thought was only available on Europe. 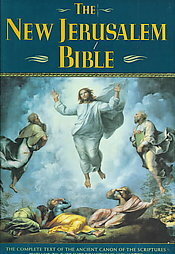 I should have also mentioned the beautiful hardback NJB Saints Devotional Bible by Bert Ghezzi. It is a very attractive edition, with lots of info on the saints. Would love to see something like this with future Bible editions.